This year has seen an influx of internet-connected devices, from home locks, to smoke alarms, to egg trays. But the long arm of Bluetooth has left bike locks relatively untouched—until now. Today, a smart lock called Lock8 launched a Kickstarter campaign—and it's the second smart lock to hit the platform in as many weeks. Lock8 is the brainchild of Franz Salzmann and Daniel Zajarias, who hatched the concept while students at Oxford. “At university both our bikes got stolen multiples times,” explain the duo in their pitch. “Surprised that there wasn't a technologically advanced bike lock on the market, we decided to build one ourselves.” That was only a year ago—today, they have a fully-functional prototype and are looking to ship their first devices in May. Here’s the gist of how Lock8 works: The device arrives as a Bluetooth-connected hub, which mounts to your frame via an aluminum clip. You secure it using a wired cable, which is the bit that locks into the hub itself. Inside the hub, there's a gyro-accelerometer (to detect motion), along with sensors for light, temperature, GPS, and vibration. The batteries are charged as you ride, thanks to a set of magnets that attach to the bike’s wheel reflectors. Lock8's iOS- and Android-supported app is the brain the controls the whole setup. The app’s UI lets you easily swipe between “locked” and “unlocked.” And yes—there’s a key fob included in case your phone dies (or you lose it). But Lock8's real selling point is its alarm function: If the internal accelerometer or thermometer senses tampering by saw or flame, it sends a text alert to you (or any number of friends). It also triggers a loud alarm. Of course, as we’ve seen with microchipped bikes that have been stolen in the past, actually recovering the bike is up to you (or, hopefully, the police). Maybe the most compelling part of Lock8’s pitch isn’t the alarm protection or keyless unlocking—it’s the device’s potential for creating shared networks of bikes. Because you can add and delete fellow unlockers at will, it’d be easy to create a widely-accessible network of bikes—shared either by a group of friends or even a hotel’s customers. The Lock8 app includes a set of community features that are designed to foster communities around the locks—for example, a “rent” option that will let you put your bike up for rent online. It’s easy to imagine the pitfalls of smart locks. How long until thieves figure out a way around it? And what if the app fails? And so forth. 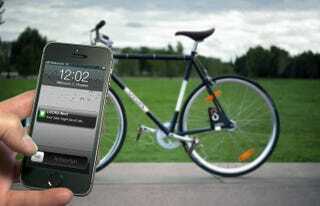 Then there’s the bigger, more rhetorical question: Is making a bike lock dependent on a smartphone app overkill? To longtime bike owners, maybe. But the added value peace of mind—whether imagined or real—might be enough to justify it. The unease of sitting at work (or a bar, or at home, or…) and imagining a thief sawing through your lock is terrible—for me, the sheer value of knowing things are cool might be enough to make any other potential glitches OK. For others, it might be overcomplicating things. Connected locks are a nascent technology—and like most other emerging categories, the first product to market can often act as a “bridge” to widespread adoption. In fact, another “smart lock” called Bitlock launched on Kickstarter just a few weeks ago. For now, we’ll have to wait and see whether Lock8 lives up to its pitch. But either way, it seems that the smart locks are here to stay. You'll be able to grab Lock8 for $199 retail, while early donors will pay $149. Check it out on Kickstarter.